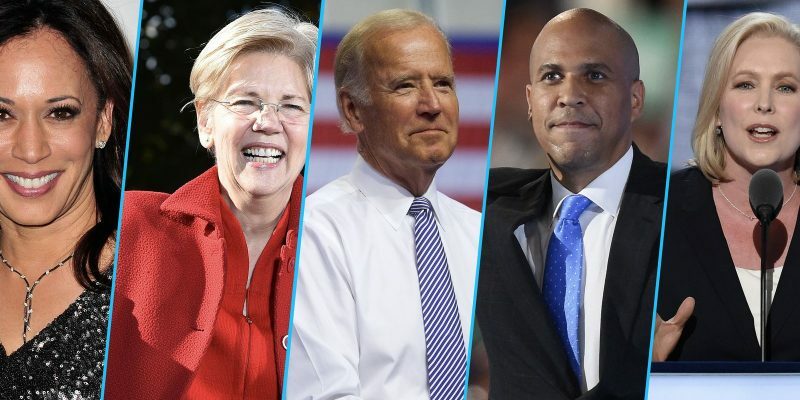 While there will certainly be more to this circus, for now there are four democratic candidates officially running for President of the United States in 2020. Meanwhile, six more high-profile Democrats continue to mull the opportunity and shop around for campaign staff. Julian Castro was the first to announce with an appearance on “The Late Show with Stephen Colbert”, a campaign video, and a subsequent announcement rally. Elizabeth Warren announced soon after with her own video and an embarrassing live-stream on New Years. Earlier this week, Rep. Tulsi Gabbard (D-HI) announced her 2020 candidacy on CNN’s “The Van Jones Show”. Most recently, Senator Kirsten Gillibrand (D-NY) also announced a presidential exploratory committee on Colbert’s late-night talk show. Perhaps the most talked-about candidates are those who have yet to announce including Joe Biden, Rep. Beto O’Rourke (D-TX), Hillary Clinton, and Senators Bernie Sanders (I-VT), Cory Booker (D-NJ), and Sherrod Brown (D-OH). Congressman O’Rourke touts one of the most impressive national donor networks thanks to his unsuccessful 2018 Senate run in which he raised $38 million. Senator Sanders is rumored to be recruiting talent for another presidential run. Despite sexual assault allegations from within his 2016 campaign, Sanders says he will “probably run” in 2020. It is rumored that his national network of supporters hosted hundreds of house parties recently in an effort to recruit him to run. Senator Brown recently announced a tour labeled the “Dignity of Work Tour” in the first four primary states. Meanwhile, Senator Cory Booker has been reportedly interviewing potential campaign managers for a presidential run. Lastly, rumors continue to swirl over whether or not the lone democrat Governor in the “deep south” will throw his hat in the ring, that being Louisiana Governor John Bel Edwards. With Democrats desperate to unseat President Trump, there will likely be another big inner-party fight to decide which approach is best: a left-wing candidate that can mobilize the base or a moderate candidate that can appeal to independents and moderate Republicans. Only one thing is certain- it is going to be a long year and a half.